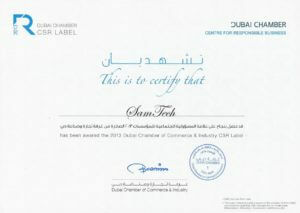 SamTech Middle East, a leader in Smart M2M Location Based and Telematics Services and On Board Diagnostics solutions, was awarded today the Dubai Chamber Corporate Social Responsibility Label for a second consecutive year. The honor underlines the company’s commitment and effective role in introducing and supporting innovative corporate social responsibility initiatives in a manner that brings about positive change in the society and the environment in general. He added that SamTech’s winning of this award for the second year in a row (see here previous award) is clear evidence on the company’s commitment to actively participating in initiatives that bring about positive change in society. Abdel Hadi stressed that the award will encourage SamTech to continue its plans that focus on social responsibility initiatives covering all aspects of daily life, including welcoming visits by students to exchange knowledge and organizing environment conservation activities, among others. Last year, SamTech Middle East launched, in cooperation with the Center for Responsible Business of the Dubai Chamber of Commerce and Industry and Dubai Internet City Authority, the “Road to Sustainability” program. The program included four workshops that sought to raise awareness on sustainability and corporate social responsibility and think up opportunities that ensure growth continuity. The workshops also touched on the importance and role of social responsibility in achieving companies’ strategic objectives in the long term. SamTech’s smart solutions help in reducing carbon emissions through providing an effective tool that makes it easier for companies and institutions to manage their assets in a smart way meeting their aspirations to adopt solutions compatible with the company’s quest to preserve the environment.